Paleo Treats | Gut Healing Gummies! It’s often said that the gut is the seat of our health. Yep, unhealthy gut = unhealthy body. And it’s an inescapable fact – years of eating a standard western diet can wreak havoc on the gut. Combine that with a stressful lifestyle, exposure to antibiotics + other medications and – BOOM – we have some serious healing work to do! Gelatin is known to be a wonderfully healing food for an inflamed, damaged gut given its ability to sooth and restore the gut lining. This is why bone broth is such a mainstay in our kitchen! But as summer rolls around, the broths and soups can’t help but get a bit dull, ya’know? Knocking up a batch of these gummies is a great way to give your gut some love – and it’s fun too! The key is finding delicious juice combinations and some fancy ice trays to mould your gummies. Speaking of fancy ice trays, let’s take a moment for these ones from Sunnylife. So gorgeous!! This recipe takes no time at all to prepare and get into the fridge, and takes absolutely no cooking skills whatsoever! If you’re on the GAPS diet and looking for a treat – these are GAPS legal! Ready for it – it’s super easy! In a small saucepan, combine all ingredients. Let the mixture sit for a couple of minutes to allow the gelatin to soften and combine with the juice. Turn on the heat to medium and stir constantly until all ingredients are well combined and any lumps of gelatin have dissolved. Don’t let the mixture boil. Pour the mixture into your ice cube tray, and pop in the fridge for about 20 minutes. Once they are set, they should be easy to pop out! Enjoy! Keep in the fridge for up to a week – or however long they last! 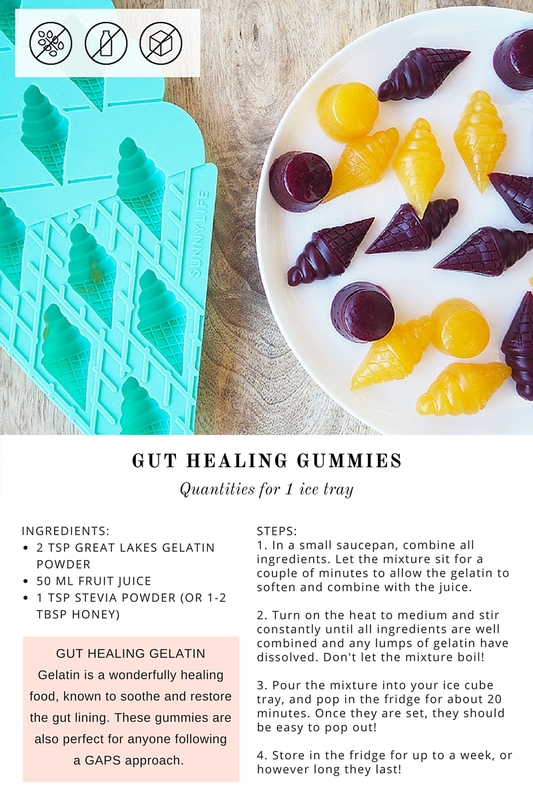 Get access to a printable copy of our Gut Healing Gummies to add to your collection!